I just got this from Hatsan Turkey: Both the Hercules and Bully in .45 do NOT use choked barrels, and have an ID of .454. So, if it's a .454 slug, and it will fit in the 16 mm magazine, it will shoot just fine. Good on ya Hatsan. 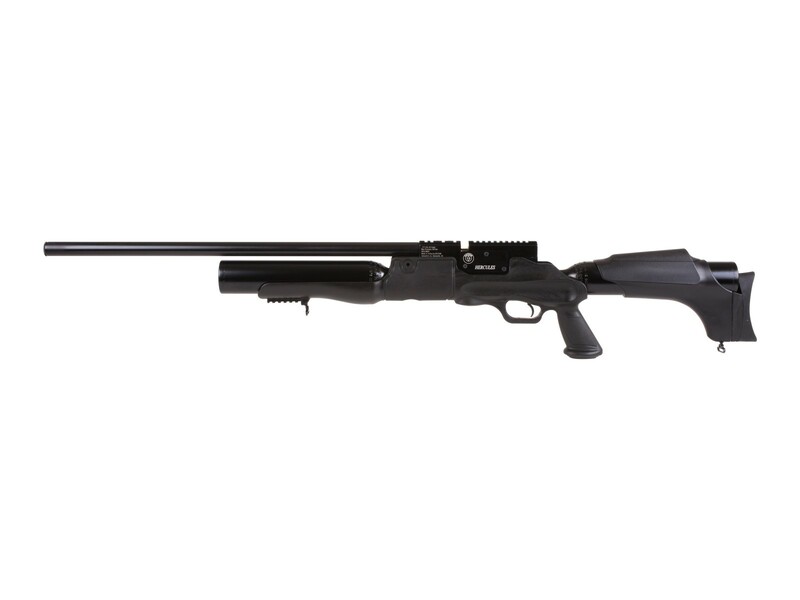 Can the Benjamin by Nosler-Extreme air rifle bullets .357 caliber fit perfectly on the Hatsan Hercules 357 air rifle? No, I'm sorry, but the magazine measures 13.25 mm deep, and the Nosler 145's are too long. It is possible that they might load single shot though. The AV 95's and 105 flat points will work in the mag though. I hope that helps. Hatsan uses it's own (Vortex) brand of pellets to test with, so the test pellet weight is 44.75 grains, which is launched at approximately 1000 fps, for approximately 97 - 115 fpe. Of course, altitude, humidity, pellet fit and the specific state of the barrel when the pellet passes through it will cause some variation. So your results may vary, but it's right in the range printed here. Is this a used gun? 999.99?? Can't be much help with the first 2, but regarding number 3, plugging the numbers into a FPE calculator, a 180 grain slug would get you 290 FPE at 850 fps. is there a degasser also can this be dry fired? Do the 166, 180 and 200 Gr AV slugs shown at the bottom of the page fit the magazine? Can anyone share their experience on which pellets fit the .45? Thanks Don! I hear that the 180's fit too. Has anyone had any experience with the 200's? Or can anyone tell us if the 200's measure less than 16 mm? Can the bolt action be moved to the left side for us "lefties"? Can mk3 pump be directly used with hercules pcp 0.177 qe? Is the barrel end threaded to accept an LDC? If so what is the threading? It comes with Hatsans Quiet Energy System , but I'm sure as the calibers get bigger they get louder . PA sells a lot of guns. I want to suggest that for every gun that you sell, you also state in the specifications section of the description, the exact measurement of the chamber of the rifle bore, and the maximum length of the slug that the magazine can take, if the gun does use a magazine? It's not such a big thing to ask, but it is so important to know. Yes! ':-)'round b#:-)!lls work, and work great. They fit easily, and I've had accuracy at 50 yards very similar to the JSB pellets. (1-2") Grizzlies fit easily too, but they go everywhere. No accuracy. Will this rifle accept the Nosler Ballistic tips rounds that the Benjamin Bulldog Bullpup will? I would rather top off the air after 18 -20 shots and get hunting accuracy. Than to waste another 30 or so pellets, not as accurate, just plinking around. Even though I may not be hunting at the time. UH 18 plus 32 is 50 ? I know most ppl would never want to try to fill this beast with a hand pump but my question is could you if you were willing to put the work and what adapters would you need? oh on a side note is it possible to fill a carbon fiber tank with a hand pump I heard someone say that once with the right set up you can. just curious.. not getting this gun or anything. Yes, you could fill it with a pump. Would take a lot of effort. Even more effort to fill a tank. And that's assuming you have a pump rated to fill to 4500 psi (in the case of the tank). Filling the Hatsan would depend on what type of attachment you have on the end of your hose. You can always use the PCP hookup section above to determine what adapters (if any) you will need. Hatsan's website has info posted now! 45 cal. rated 810 fps w/ lead ammo; 250 ft-lb; 15 shots at optimal velocity. Man why is it there is never iron sights on the really powerful PCP guns. Its like a major annoyance for me and sure I dont use them much but there ARE enough times when I do that makes me like to have them and like I love to say its better to have it and not need it then to not have it and need it.. So Its a rule of mine I will only buy gus with them on and its hold true for any guns air or otherwise which I have. Other times they come in handy if and when a scope breaks in the field or a red dot sight goes out or if a SHTF situation happens someday Iron sights are a must for me on any rifle I own. Even My PCPs but Im tempted to break that rule ot mine just for this one rifle... tempted...but not going to. P.S is some of the product info incorrect Im seeming inconstant shot counts in certain calibers. But JoeCow, this rifle is way worth not having iron sights, you can always mount a supplemental laser on one of the pic rails, the ACOG and some knock offs have iron sights mounted on top of the scopes as backup, but if it's that important the Bully HAS iron sights, and it's way worth it too. Has anyone confirmed that the Hercules is regulated? Emailed hatsanusa.com 8-7-16 to inquire if the hercules is regulated ? Answer was( it is not equipped with a regulator nor is one available as of yet) . With 1000cc of air on board it means it will shoot a lot of pellets before it runs out of air ( at least in the smaller calibers ) . 45 caliber is said to be 18 shoots per fill. At 13 pounds without a scope its even heavier than my Gladius 25 long and,even with a light scope it can weigh 14 pounds (ouch)! 100 dollars per pound. The Nova with a bottle buddy is said to be 9 pounds without a scope. They are built like tanks and always have been. It says you offer this in .45 but you have no stats listed, no shot count or fps? Hatsan USA does not list specs for the .45. When they have them, we will be able to update. Does the Riffle comes with some device to pump it up? For 1300.00 it should but I'm afraid a fill device is optional . It comes with fill probe but the rest is up to the purchaser . Can i use the m4 hill pump to fill? Yes, you can pump it up using a hand pump, but please consider that the job will not be a pleasant one. If you want to begin buying these large capacity reservoir guns, then you should really advance your accoutrements to getting a carbon tank capable of holding 4,500 psi, or better yet, buy the tank and a compressor. Filling this by hand pump is like walking from New York to California. Can it be done? Of course, but wouldn't you rather fly? Yes be prepared for a workout ( your filling two air tanks ) . You need to purchase an Air Venturi Male Quick Disconnect PY-A- 3550.